Dieffenbachia – evergreen plant of the family Araceae, originating from tropical South and Central America. At room conditions grown mainly for its decorative appearance, although it is believed that dieffenbachia as dracaena and rubber plants, can purify the air of toxins. Like many tropical plants, dieffenbachia sensitive to the consistency and composition of the soil mixture. When planting you got apical stem of dieffenbachia, or you want to rejuvenate stretched to the height of the old plant that has lost its decorative look, you can root the cuttings in water. This method is familiar to many flower growers. Place the cutting in a soft water at room temperature and put in a bright location with temperatures of twenty to twenty-four degrees. Ensure that the plant does not fall to direct sunlight. From time to time wipe the leaves with a damp cloth. When the rooted cuttings grow to two to three inches, put the plant in the ground. To do this, select a clay pot of medium size. Of course, you can use the more decorative plastic pots, but clay containers due to its porous structure best adjustable humidity earthen clod. A quarter of the height of the pot make a layer of any drainage that you use for planting flowers. It can be ceramic or ceramic drainage. Some growers use as drainage chips from packing foam in the mixture with the hydrogel. Over the drainage place a small layer of washed river sand. 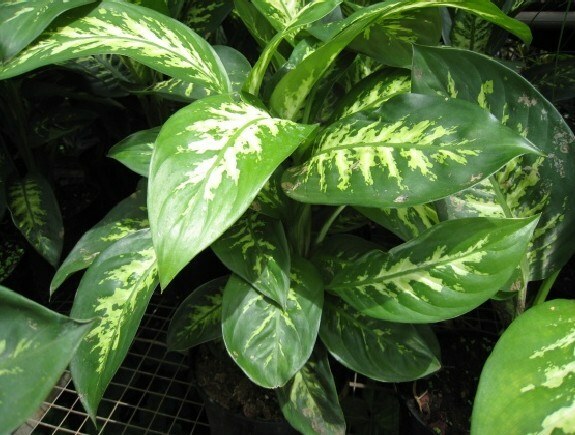 Dieffenbachia grows well in slightly acidic loose soil. To prepare this soil, mix one part river sand, two parts humus earth, the four parts of leaf and the same quantity of peat land. Sometimes it is recommended to add to the soil mix a bit of crushed charcoal. Lightly moisten the soil and vysypite it in the pot over the drainage and sand. Plant rooted cutting and lightly seal the soil mixture around it. Place the plant in a warm place without direct sunlight. Pour dieffenbachia soft water after the soil mix dry out. Every two weeks, wipe the leaves with a damp cloth. Since the juice of dieffenbachia is poisonous, it is recommended to use this plant in rubber gloves. Also, keep this plant in a place which can't get children and Pets. Dieffenbachia (Dieffenbachia) is a houseplant with evergreen leaves, native to wet rainforests of Central and South America. 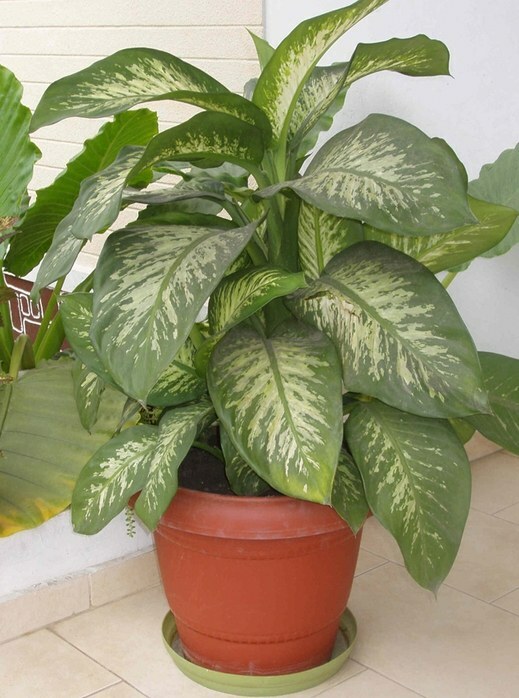 The main decoration dieffenbachia are large, brightly colored leaves. Pattern form different tones of green colors, spots and stripes in ivory, which make every leaf of this plant is a real decoration. 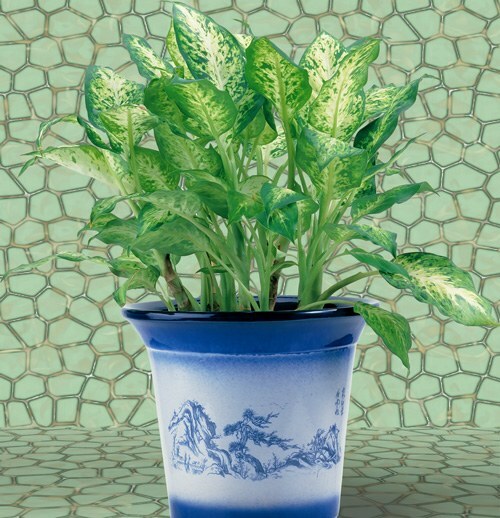 Since dieffenbachia is a tropical plant, it is used to the high humidity environment. But not for nothing that the phrase "tropical plant" refers to a particular sensitivity and moodiness to the conditions of detention and care. To water the dieffenbachia should be very moderate. Before watering, you must make sure that the soil is already dry after the previous watering. Take a long, thin sliver and stick it in a pot with soil if it stays dry, without adhering to the land, pour the flower water pooled at room temperature. After watering, wait 15-20 minutes and drain without a trace all the water that builds up in the pan. To leave her not so that the plant roots do not rot. In the spring and summer irrigation should be done quite often, in winter less frequently. Constantly ensure that the drain hole of the pot is not clogged and if necessary clean it. Spray the plant every day on both sides of a sheet of spray. The leaves also need to be wiped with a damp soft cloth and a mixture of non-alcoholic beer with water to form a grey haze and smudges from dried water drops. The colour change of the leaf tips is the best indicator of incorrect watering. If they become yellow and dry – a plant lacking water. If it is first wet, and then become brown and dry – you pour too much water. In spring and summer, every 10 days watering it is necessary to combine with the feed of the weak solution of fertilizer. In autumn and winter and such feeding can be done 1 time per month. In that case, if there is a constant wetting, the base of the stem can rot, turn pale and soften. In this case, you can try to save the plant, will plant the tip in the new soil. From the waterlogged plant leaves may turn yellow and curl up as the root system is rotten. Dieffenbachia is a popular houseplant that is grown in offices and homes. This decorative evergreen plant has large leaves with variegated color and with proper care, reaches a height of two meters. Sooner or later, dieffenbachia, as well as any other plant, require a transplant. How correctly to repot, so as not to damage the roots? Dieffenbachia grows very quickly at a young age, so she needs a transplant every year in early spring. First, set up soil substrate in two parts sod land, one part peat land, one part humus, and half of the river coarse sand. If the soil was hard, it is recommended to increase the amount of sand. The entire substrate mix thoroughly. Prepare the new pot, which should be more than the previous a couple of inches. Do not use for transplant too large capacity since excess soil, undeveloped roots dieffenbachia, lead to acidification of the earth, and it is fraught with the death of the flower. At the bottom if no drainage holes, do them with Sheila (namelennogo over the fire). On the bottom of the prepared pot place a layer of drainage in the form of small pebbles, expanded clay or broken shards. Then add a little soil substrate and gently, without destroying the integrity of earthen clod, cross a plant from a small pot into the new one. Dieffenbachia pour warm water supernatant. In the spring and winter period provide an indoor plant in good light. To do this, place the pot on a window sill located on the South side. You can use artificial lighting in the form of fluorescent lighting. In the summer it is recommended to remove the dieffenbachia in the shadows so as not to burn the leaves to direct sunlight. This plant needs certain temperatures. 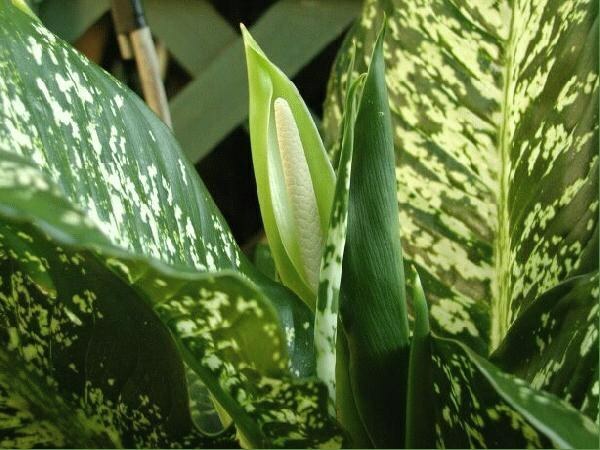 In the spring and summer season dieffenbachia feels comfortable at a temperature of 20-22 degrees. At a higher temperature, ensure high humidity by sprinkling the plant with a spray bottle is soft and separated by water. Once a week wash the flower under the shower, cleaning it the dust. Remember that dieffenbachia is a poisonous plant (if you are getting juice on the skin can begin as an inflammation or swelling), because when working with this flower use gloves. Keep small children and Pets. 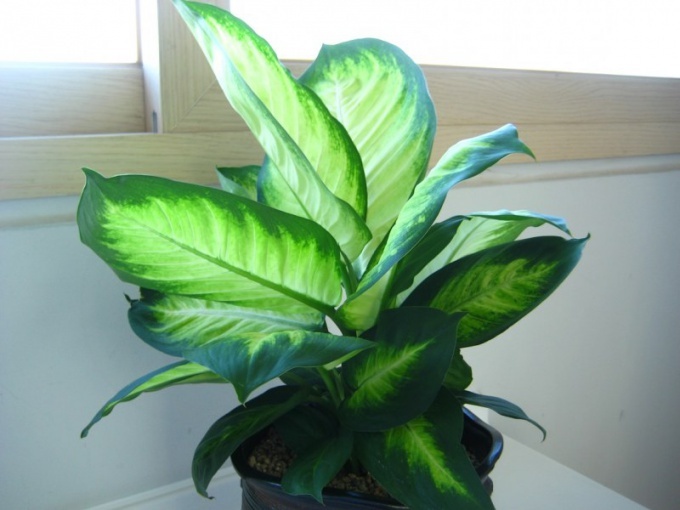 Dieffenbachia is a spectacular plant that is very appreciated by interior designers. Rather, it is a group of plants of the family Araceae, now there are more than fifty species of dieffenbachia. These natives of the South American tropics thrive in large spaces. They grow very fast. The main decorative element of leaves, but the flowers also look pretty elegant. Almost all species of dieffenbachia – straight thick fleshy stems. Most often this plant has a single growth point at the tip of the shoot. But some species are well branched. All dieffenbachia grow very fast. Over time, the bottom of the stem stiffens and becomes bare, so the old plant is gradually losing its beauty. But it does not matter, because dieffenbachia unpretentious and quite easy to tolerate a transplant. European growers cultivate such species of plants as dieffenbachia Leopold, a Charming, Oersted, Bouse, Sika and others. Now among the many species and varieties of this plant is a dwarf form, so that the flower can decorate not only a spacious office and a small apartment. In most species the stems and the leaves are oval, leathery, with white spots, although there are plants rich green color, without any gaps. In the indoor horticulture are now known not only different species of plants, but also quite numerous hybrids. They bloom about the same. Like all Araceae plants, dieffenbachia inflorescence is a spathe, resembling corn. Flowering usually begins in the spring, in late April or early may. The appearance of a flower – an amazing sight. The cob comes out of the bosom of the sheet. It has a veil, often cream-colored, sometimes greenish. Unfortunately, dieffenbachia at home it blooms very rarely and not for long. Flowering lasts a few days. Then the ear fade, but he does not fall off. It is best to cut it off because it robs the plants of nutrients. If dried on the cob not to remove, plant growth may slow down. Sometimes the lower leaves begin to dry and fall off more rapidly than netsvetuschie plants. However, dieffenbachia, some insects pollinate our latitude, and if that happens, the site of the flower will appear bright red or orange berries, very decorative, but poisonous. Dieffenbachia, of course, very beautiful, but to put it not in all areas. For example, it is not recommended to decorate with these plants, the kitchen or the nursery. Do not keep dieffenbachia institutions. The fact that all parts of any species of this family are poisonous, especially toxic juice, which is even just in contact with the skin causes burning and irritation. Juice of dieffenbachia white. If it enters the mouth, the tongue swells and the person loses the ability to speak. South American Indians from this plant to prepare drugs for baiting rats.